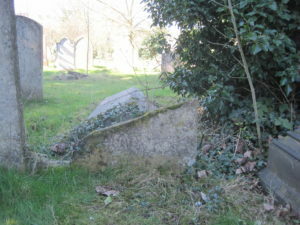 This headstone, broken and the upper part fallen, in the parish area of St Edward, is located on the first row west of the central path, about 25 yards north of the centre circle. There are four graves in the St Edward area for the Bays family, the other three being (Charles Frederick Bays), (Emmeline and William Bays) and (Agnes Mary Bays). There is also a grave for the senior generation of the Bays family at (Frances and Mary Ann Bays). Charles was born on 12 September 1804 in Cambridge, and baptised in St Edward’s Church on 8 October of that year, son of James Bays, hatter of 11 King’s Parade in central Cambridge, and his wife Frances. 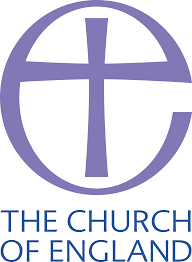 Charles married Mary Bradshaw of Huntingdon, at the church of All Saints and St John there on 5 August 1834. Charles’s father James died in August 1840, and by 1841 Charles and Mary were living at the King’s Parade address, Charles having taken charge of the business, which he was to manage for 36 years. The couple went on to have nine children (see below), of whom William took after his father by becoming a hatter. Charles died on 18 December 1877 aged 73, and his body was buried on the 22nd of the month in Mill Road Cemetery, in row XXXIII of the St Edward parish area, in plot 6 at a depth of 10 feet. His will was proved by his executors, his son William and one Isaac Basham, woollen draper, his estate worth less than £600. William took over the business, which was to thrive and continue until after the Second World War. Her identity is uncertain (the ages given for her in census returns vary widely), but the most likely candidate is Mary Bradshaw, born in Huntingdon in 1810 and baptised in 1811 at the church of All Saints and St John there, daughter of William Bradshaw, butcher of High Street, Huntingdon, and his wife Mary. Mary’s siblings included Ellen and Ann (both of whom appear on the 1851 census visiting the home of Mary and her husband in Cambridge, identified as nieces), and Susan and Sophia. Mary married Charles Bays, hatter, at All Saints and St John, Huntingdon on 5 August 1834. Charles’s father James, hatter of 11 King’s Parade in central Cambridge, died in August 1840, and by 1841 the couple were living at that address, Charles having taken charge of the business. The couple had at least nine children: Alfred Charles (c.1836‒), William (1836‒86), Agnes Mary (1839‒86), Charles Frederick (1841‒58), Edwin (1843‒), Emily Mary (1845‒), John Bonfoy Rooper (1847‒), Henrietta (1848‒), and Emilia (Emily) Rosa (1852‒). By 1861 William had himself become a hatter, and the household had two servants. By 1871, Edwin had become an architect, and the household had its first grandchild, Agatha Bays. Charles died in December 1877, and William took over the business. By 1881, Mary had moved to 3 Bay Terrace, Norwich Street (New Town), Agnes Mary was living with her, and each was listed in the census return as ‛annuitant’. A year later, in June 1882, Mary died aged 70. She was buried on 14 June in Mill Road Cemetery, in row XXXIII of the St Edward parish area, in plot 6 at a depth of 8 feet.